Originally native to Eurasia, domesticated Rock Pigeons were introduced to North America from Europe. In Minnesota the bird is now a permanent resident found statewide. The Rock Pigeon was a common species during the Minnesota Breeding Bird Atlas (MNBBA). Distributed throughout the United States and across southern Canada; in the Pacific Northwest it is found along the coast north to southern Alaska. Scattered pockets of high abundance are found throughout its range, including in Wisconsin and southern Minnesota (Figure 1). As an introduced species, the Rock Pigeon is not a conservation concern in Minnesota. Ground forager that consumes seeds and fruits. Natural nest site is a rocky cliff ledge; in urban and rural landscapes it nests on a wide variety of protected ledges, including under bridges, on tall buildings, and on barn lofts. Breeding distribution and relative abundance of the Rock Pigeon in North America based on the federal Breeding Bird Survey from 2011 to 2015 (Sauer et al. 2017). For a species that virtually surrounds anyone who lives in one of Minnesota’s large metropolitan communities, or even on a rural farmstead, we know remarkably little about the Rock Pigeon’s first appearance in the state. It was 1960 before a specimen was added to the collections at the University of Minnesota’s Bell Museum of Natural History. Indeed, throughout North America, early naturalists and ornithologists essentially ignored the species for more than two centuries. When people spoke of pigeons in the 1700s and 1800s, they invariably were referring to the country’s most abundant member of the pigeon family, the Passenger Pigeon. Years later, Arthur C. Bent’s encyclopedic, 21-volume series The Life Histories of North American Birds did not include an account of the Rock Pigeon, even though he addressed in detail many other nonnative species, including the European Starling and House Sparrow. In Minnesota, neither Hatch’s 1892 account of Minnesota birds nor Roberts’s 1932 2-volume treatise on the state’s avifauna makes mention of the bird. In fact, for the first 73 years of its existence, participants on National Audubon’s annual Christmas Bird Counts were not permitted to officially tally and submit for compilation the number of Rock Pigeons they observed. Originally introduced to eastern North America in the early 1600s by colonists who brought domesticated Rock Pigeons from Europe, the birds soon became a common farm animal, raised solely for the purpose of food. Escaped birds eventually gave rise to today’s widely distributed feral populations. No doubt some of Minnesota’s earliest settlers traveled with pigeons in tow or had then shipped in at a later date. Unfortunately, we can only conjecture about the species’ appearance based on accounts from other midwestern states. Even there the records are scanty. Temple (2006) remarked on the sparse records available during the 19th century in Wisconsin, commenting, “Perhaps these early pigeons were dismissed as captives and not recognized as truly feral birds, or perhaps birds that escaped were soon shot for pigeon pie!” Farther east, in Ohio, there is a somewhat better account of the species’ appearance. Shumar (2016) notes that a feral population first became established on Kelly Island in Lake Erie in 1906; then birds appeared in Cleveland in the mid-1920s and were widespread in the state by the 1930s. So it certainly seems possible that some feral birds were already present in Minnesota in the early 1900s. The first written account of the species’ presence in Minnesota was in the state ornithological journal, The Loon, in the summer of 1944. A summary of nesting records for the previous year included a small note that on May 26, 1943, young had been observed at the state capitol in St. Paul (Chambers 1944). Just 30 years later, when Green and Janssen (1975) published their updated status account, the species was already considered statewide in distribution, present wherever farms and cities dotted the landscape. Janssen (1987) later reported that nesting had been documented in 5 counties since 1970; Hertzel and Janssen (1998) added an additional 6 counties to the list. No doubt it was more widespread as a nesting species but simply not a priority among birding enthusiasts. During the MNBBA, observers reported a total of 2,896 Rock Pigeon records in 37.7% (1,824/4,841) of the atlas blocks surveyed and in 47.2% (1,103/2,337) of the priority blocks. Breeding evidence was gathered in 418 blocks (Figures 2 and 3; Table 1). The species was reported in all 87 of Minnesota’s counties and was confirmed breeding in 71 counties. Records were least abundant in the far northeastern counties of Cook, Lake, and northern St. Louis and in the far north-central region of the state. Breeding distribution of the Rock Pigeon in Minnesota based on the Breeding Bird Atlas (2009 – 2013). Summary statistics of observations by breeding status category for the Rock Pigeon in Minnesota based on all blocks (each 5 km x 5 km) surveyed during the Breeding Bird Atlas (2009-2013). Summary statistics for the Rock Pigeon observations by breeding status category for all blocks and priority blocks (each 5 km x 5 km) surveyed during the Minnesota Breeding Bird Atlas (2009-2013). Wild Rock Pigeons in their native habitat nest amid the ledges of rocky cliffs. Today, some feral birds will nest in such habitats when they are available and are close to a dependable food source, but they are more often found in close association with people, occupying small cities, dense urban areas, and rural farmsteads (Figure 4). Any suitable ledge may be deemed appropriate nesting habitat, from small ledges on tall buildings, to large highway overpasses and small bridges, to grain silos and farm lots. Today, feral populations of the Rock Pigeon are almost entirely dependent on human landscapes for roosting sites, nesting sites, and food (Lowther and Johnston 2014). Within 200 m of MNBBA point counts where Rock Pigeons were detected the primary habitat was cropland followed by oak forests, development, and grasslands (Figure 5). The oak forests were likely woodlots on farmsteads and city parks. Typical breeding habitat of the Rock Pigeon in Minnesota (© Lee A. Pfannmuller). Habitat profile for the Rock Pigeon based on habitats within 200 m of point counts where the species was present during the Minnesota Breeding Bird Atlas (2009-2013). In 2013 biologists estimated the global population of Rock Pigeons at 120 million birds, of which approximately 12 million occur in North America and 9.1 million in the United States. The statewide estimate for Minnesota is 560,000, which is 0.5% of the global population and 4.7% of the North American population (Partners in Flight Science Committee 2013). As adaptable as this species is, it has experienced, somewhat surprisingly, a steady and significant population decline throughout its range. Since long-term monitoring began in the mid-1960s, populations have declined at a rate of 1.22% per year. The decline was steepest from 1966 to approximately 1975. In Minnesota the species has experienced a similar significant trend, declining at the rate of 1.11% per year since 1967. Unlike the national trend, which was positive in the most recent 10-year reporting period, from 2005 to 2015, in Minnesota populations were still declining at a rate of 0.52% per year (Figure 6). Factors responsible for the decline have not been closely examined, but focused efforts in some rural areas and cities to reduce local populations are not uncommon (Lowther and Johnston 2014). 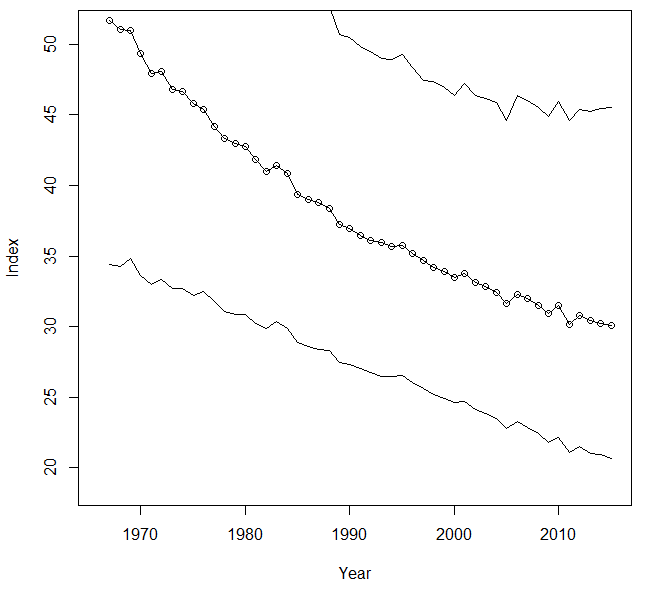 Breeding population trend for the Rock Pigeon in Minnesota for 1967-2015 based on the federal Breeding Bird Survey (Sauer et al. 2017). Despite declining populations, the feral Rock Pigeon remains a highly adaptable species that is widespread and relatively abundant across North America. A warming climate should pose no threat to this species. Management activities are focused solely on reducing their use of buildings for roosting and nesting through the use of poisoned bait, traps, and other creative tactics (Lowther and Johnston 2014). Chambers, Amy. 1944. “Minnesota Nesting Record, 1943.” Flicker 16: 10–14. Shumar, Matthew B. 2016. “Rock Pigeon.” In The Second Atlas of Breeding Birds in Ohio, edited by Paul G. Rodewald, Matthew B. Shumar, Arron T. Boone, David L. Slager, and Jim McCormac. University Park: Pennsylvania State University Press. Temple, Stanley A. 2006. “Rock Pigeon.” In Atlas of the Breeding Birds of Wisconsin, edited by Noel Cutright, Bettie R. Harriman, and Robert W. Howe. Waukesha: Wisconsin Society of Ornithology, Inc.